A.J. Mahari's Audios/Videos to help you learn to more effectively cope through skill-building and cultivating conscious awareness that supports positive change. Borderline Personality Disorder causes tremendous loss. This is an ode to my loss. A loss that though grieved and healed beyond BPD still requires on-going expression from time to time. Validate your loss, it is your way back. Grieving the pain of the loss that originates from the core wound of abandonment that is central to the experience of what it means to have Borderline Personality Disorder is the way to get on and stay on the road to recovery. The reality of Borderline Personality Disorder is that it has its main origin in the core wound of abandonment and it is a reality of valiantly trying to out-run a loss that feels like death and that is the actual psychological loss of the authentic self to The Shadows and Echoes of Self - the false self in BPD. Everyone will experience loss of some kind in life. For those who develop Borderline Personality Disorder (BPD), however, loss becomes almost like a way of life. The very many defense mechanisms put to use in the combating of this loss borderline style more often than not produce much more loss. It is a very sad and painful cycle to try to exist within. It is a reality, this loss, that many with BPD, are not consciously aware of. Somehow I think this doubles the pain. Becoming aware of the mechanics and reasons for all of one's loss can quadruple the pain, initially. Still, one must wade through his/her loss and actively grieve it if one is going to heal. If you have Borderline Personality Disorder there is no quick or easy or "pill-fix". The way to heal and recover from BPD is to grieve your abandoned pain and to take the journey From False Self To Authentic Self by getting in touch with your inner child. 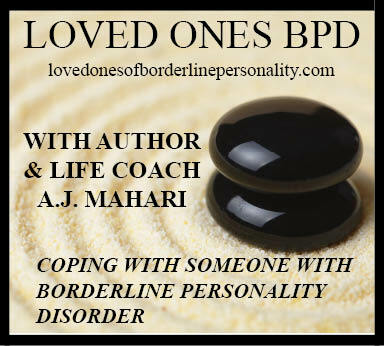 On the other side of BPD - family members, loved ones, relationship and/or ex-relationship partners also know and experience tremendous loss and its many lessons at the hands of Borderline Personality Disorder. © A.J. Mahari, June 16, 2001 with additions August 2, 2008 - All rights reserved. Mental Illness is Not a Brain Disorder. Psychiatric Medications is not the answer.